Something didn’t feel right about this group. There were perhaps eight adults, men and women, some carrying infants, some rolling large wheeled luggage behind them along the stone and dirt towpath. It was early afternoon and hot, the day of the total solar eclipse. After politely fending off further faith-related questions, I biked away, but the encounter continued to bother me. These were not typical towpath hikers. They looked unprepared for a miles-long walk to a primitive campground on a hot summer day. And what were they doing out there with such young children? This was my first solo ride as a C&O Canal bike patroller, and my very first visitor contact on my own. I wasn’t sure how to handle it. But I remembered what I’d been advised at Bike Patrol orientation a couple of weeks before: If something doesn’t feel right, call it in. So I stopped, pulled out my cell phone, and called the National Park Service communications center at C&O Canal National Historical Park headquarters. The dispatcher told me the group fit the description of one believed to have left a minivan with lapsed registration in the Swains Lock parking lot, right where I happened to be standing. I walked over to it. Behind the car stood a child’s crib full of all kinds of stuff—a large plastic bucket, a folding chair, an empty fast food bag, empty bottles, a big clump of keys—along with several large plastic bags full of trash reeking of dirty diapers. It looked like those who left all this weren’t planning on coming back. Volunteers for the C&O Canal Bike Patrol have been cycling up and down the towpath since 1999. The program was modeled after one developed at Cuyahoga Valley National Park in Ohio. The program is staffed and run by volunteers and overseen by a Park Service coordinator at each of four districts along the 185-mile canal. The number of volunteer bike patrollers has grown to well over 150. 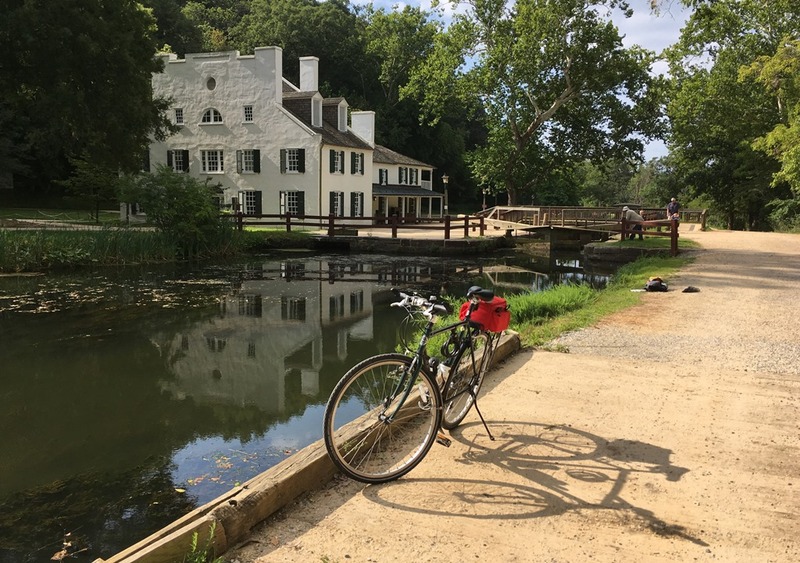 The Bike Patrol for the Palisades District covers the canal from its start in Georgetown to Monocacy Aqueduct at around Mile 42. This includes the most visited section of the canal, the 23 miles from Washington, D.C., to the Seneca Creek Aqueduct in Maryland. Bike patrollers serve as the “eyes and ears” of the Park Service. They provide information and assistance to visitors, keep an eye out for violations of park rules, report hazards or other park resource issues, and call park rangers for assistance when needed. Bike patrollers also fix flat bicycle tires and make other minor bike repairs, offer basic first aid, hand out maps and water, and serve as ambassadors for the park. To apply to join the Bike Patrol, you fill out a Park Service volunteer application, attend a half-day orientation session, and go on at least two training rides accompanied by an experienced bike patroller, who serves as a mentor and evaluates your performance. Once approved for the program, you receive an official Bike Patrol safety vest, so visitors can easily identify you. Then you can patrol as much as you want, wherever and whenever you want. You must call in to the Park Service communications center at the start and end of each ride, so they know where you are. You must wear your helmet and vest and carry basic bike repair equipment and first aid supplies. You should also bring along some maps and bottled water to give away to those who may need it. At some time during your first year, you must take a bike repair class and a first aid class, both offered in the park, to enhance your ability to deal with situations you may encounter. You don’t need to be a really chatty person—everyone develops their own style of interacting with visitors—or have experience fixing bikes or providing first aid. You just need to want to help people to whatever extent you are comfortable or capable. Great Falls Tavern, headquarters for the Palisades District Bike Patrol, and my Trek 520 patrol vehicle. A bike patroller I met while cycling on the towpath told me about the program and encouraged me to apply. I did so, attended the orientation, and went on my two training rides. I couldn’t have asked for better mentors. Norman, a jocular, outgoing guy, helped found the C&O Canal Bike Patrol program in 1999. Vinn, a little less extroverted but energetic and dedicated, received the National Park Service’s Individual Volunteer Award for 2016. Some company! Both taught me a lot and offered great encouragement. Some people involved in the Bike Patrol also volunteer for the park’s Bike Loaner Program, which allows visitors at Great Falls in Maryland to borrow a used, well maintained bike for free. Some also volunteer at the park visitor center in the Great Falls Tavern or are involved in other park activities. In short, the Bike Patrol is a great way to get involved in the culture of volunteering at a treasured local national park. I’ve only been a bike patroller for a few weeks; I have a lot to learn. I look upon each patrol as an opportunity to improve how I interact with visitors. I’m an introvert, but I do like helping people, and I strive to be friendly and approachable while on patrol. After my first patrol on my own, once I’d logged in my hours on the Bike Patrol website, I thought about each encounter I’d had with visitors, what I did right, and what I could have done better. For example, in the case of that unusual group I encountered, I should have been more observant. Exactly how many men, women, and children were there? About how old were they? I should have asked more questions. Where did they start? How far were they going? Did they know what to expect? When were they planning to return? I offered them water but forgot to offer them a map. But I did alert Park Service personnel about my concerns, and they took it from there. I don’t know what became of them. I had three other brief visitor contacts on that first ride. They seemed like such textbook examples drawn from orientation that my mentors could have set them up just to test me. First, a bicyclist flagged me down because he was curious about the Bike Patrol program. I talked with him about it, gave him contact information, and encouraged him to become involved—just as someone did for me. Second, while I was talking to him, a couple of sweaty and tired-looking walkers stopped to ask directions. They weren’t sure if they were headed in the right direction to get back to their car. I nearly misdirected them at first, but after taking the time to ask a few questions, I realized they were confusing Great Falls Tavern with Old Angler’s Inn, and I was able to assure them they were headed the right way. I gave them a map of the area and offered them two bottles of water, which they gratefully accepted and drank right down. Finally, I noticed a young woman walking an unleashed dog, and I politely asked her to please keep the leash she was holding attached to her canine companion, as the Park Service requires. She complied. I felt pretty good after my first ride on my own as a member of the C&O Canal Bike Patrol. If you love the canal and like to bike and enjoy helping people, I encourage you to join. This entry was posted in Bicycling, Local, Maryland. Bookmark the permalink. 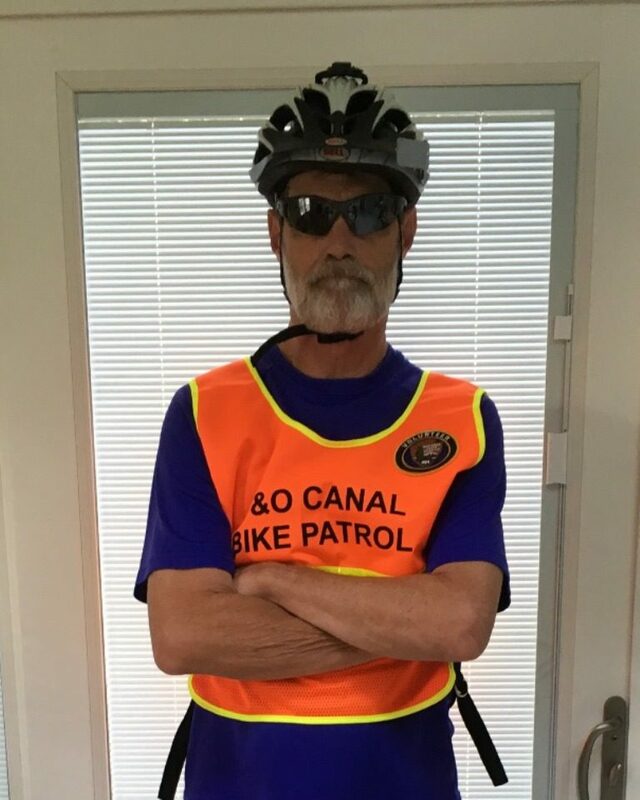 Congratulations on becoming a C & O Canal Bike Patroler! This seems like a perfect fit for a dedicated bicycler such as yourself. Think of all the interesting folks, canines, and other critters that will pass your way as you bicycle on the C & O. May you serve many many years and find validation for this choice of volunteering.